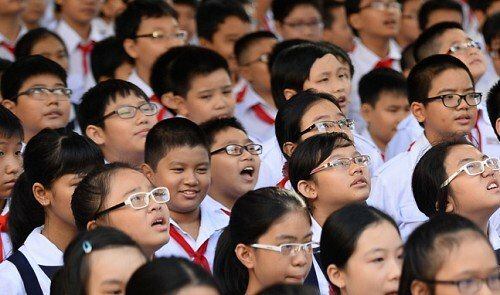 The worldwide prevalence of nearsightedness has increased over the past several decades, particularly in parts of Asia. Nearsightedness typically begins in children, and the age at which nearsightedness begins is only skewing younger. It is estimated that in 30 years, over half of the world’s population will be nearsighted and over 10% will have severely high nearsightedness. Glasses, contact lenses, and Lasik are the appropriate treatments once the problem occurs, but what is causing this increasing problem and what can be done to prevent it? There is strong evidence that the amount of time a child spends outdoors during the ages of 5-17 years old, which is when nearsightedness typically develops, is critical. More time spent outdoors results, on average, in less nearsightedness. A recent analysis of all studies on this subject suggest that an additional 75 minutes per day of time outdoors cuts the incidence of nearsightedness in half. One logical hypothesis is that sustained near focusing is the real problem and that being outdoors lessens or counters this. However, research has found this to be untrue. Rather, it seems that other factors of being outside, such as ultraviolet light exposure, increased body production of Vitamin D, pupillary constriction when outdoors, or increased physical activity when outdoors are serving as possible remedies to the problem. Eyedrops have been widely used in Taiwan, Singapore, and elsewhere around Asia to control the progression of nearsightedness in children. Recent studies have confirmed that this is an effective treatment. The drops are well-tolerated by the children and effectively slow down the progression of nearsightedness with little rebound effect when they are stopped. Use of these drops still remains uncommon in the United States. A possible reason is that stronger drops were used in the past and had unfavorable side-effects. But the new low-dose regimen works well with very few side-effects and no significant safety issues. So, if your child is developing nearsightedness, get them outdoors for more time each day and start on the low-dose eyedrops (atropine 0.01%). Long-term studies are still needed to determine which kids will benefit the most and to prove that the effects are indeed permanent, but there is little downside to taking the drops in a low dosage. Of course, if everyone follows this advice we will have fewer people needing our Lasik services, but that is ok! Should you require Lasik eye surgery in Beverly Hills, Caster Eye Center is here to answer any questions or concerns you may have and get you on your way to crystal clear vision. Please don’t hesitate to contact us for a personal consultation!